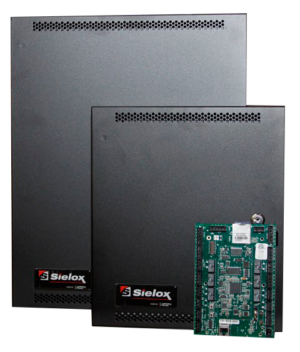 The renowned Sielox 1700 Access Controller is an intelligent, fully distributed 32-bit access control panel for up to 34 doors that provides facility protection even if communications have been interrupted. This field-proven, cost-effective, expandable and serviceable unit connects directly to a network, saving costs. The 1700 Controller features a removable SD card with a storage capacity ranging from 128 MB to 1 GB to keep helpful information handy and to support instant recovery and setup when swapping boards. The SD card can also house a redundant controller configuration, cardholder database, events, maintenance log, wiring diagram, installation manual and more. This intelligent controller supports industry standard reader types and technologies including, FIPS 201(PIV), CAC, Wiegand, card and pin, proximity, biometric, smart card, magnetic stripe and barcode. Maintenance and firmware updates can be accomplished locally, or using a web based maintenance port that uses secure AES 256 encryption.